Hire a Water Truck for WA mine sites and beyond. Ready to Roll. Nothing impacts how efficiently you do your job more than having the right tools. When you’re working on large scale projects, every detail of the equipment matters. When conditions change or you begin working on a different phase of the project, you might need a water truck to keep dust under control. There’s no time to wait to get the right equipment. Using the wrong equipment at the site greatly reduces efficiency. More importantly, it can reduce safety for your workers and anyone around the site. What Are the Right Water Trucks for the Job? The best water trucks carry larger loads that reduce the number of trips needed to refill them. A large capacity tank that is made with a low centre of gravity provides greater stability. A tank that is square reduces the sloshing of the water which can shift the centre of gravity. The water trucks at Fleetspec Hire are made with square large capacity water tanks that reduce the sloshing of water. You can fill them to capacity without worrying that it will impact the safety of the driver. Our trucks also have a rollover protection structure (ROPS) to help protect the driver in the unlikely event of an overturn or rollover. Another important feature is the flexibility of water output. When workers have a choice over the control of the water output, they only spray as much water as they need. There is less risk of oversaturating roads and creating a slick surface. Truck operators have control over the amount of water sprayed and adjust to each situation. Fleetspec Hire offers multiple spray heads for better control of water spray volume. A dribble bar provides high pressure spraying for areas where high-speed dust suppression and watering is required. A water cannon shoots high-velocity water over many metres as needed in mining operations. Nearly all water trucks implement baffling systems to prevent water from surging. The difference in the system’s design makes it more or less efficient. Baffles with large holes that allow access to workers also let the water move freely. Smaller holes allow the water to move through the tank without allowing surges. Baffles are sometimes present throughout the length and height of the tank. Others implement side-surge stabilisers along the interior walls to improve tank stability. 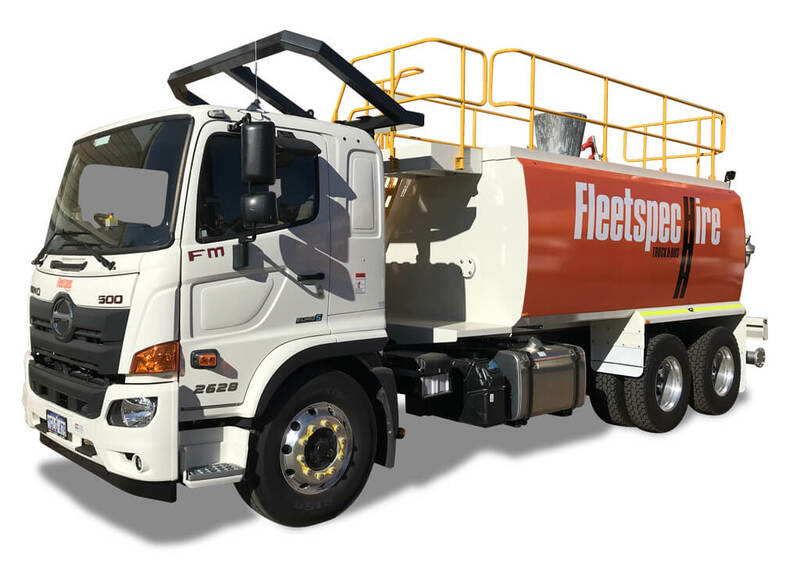 The highly specialised fleet vehicles from Fleetspec Hire are designed with the safety of the drivers and crews in mind. Our trucks are fully equipped with all the safety requirements and have full mine spec on all service and fuel truck rental vehicles. The best way to avoid cutting corners and creating a safe and efficient worksite is by having the right water trucks available when you need them. Fleetspec Hire has been providing mining and construction companies with quality products for more than twenty years. We know what it takes to do any job efficiently and safely. That’s why we provide reliable water trucks that are ready to roll when you need them. You never have to choose between ordering the right equipment for the job or cutting corners and using what’s available. Our trucks have short- and long- term capabilities. They make any job safer and more efficient, and they’re always available when you need them. Contact Fleetspec Hire, Perth on 08 9244 4748 today to get the right equipment for your next job.